Met papier op papier (Nederlandse Kunststichting : Amsterdam 1972) stapled. 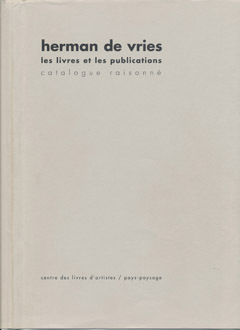 Texts by Friedrich Heckmans, Herbert F. Franke, and others. strukturierte monochromie. november 72-februar 73 (Galerie Teufel : Köln 1972). zufallsprogramme April 27-May 25, 1974 / [text by Urs and Rös Graf] (Galerie Lydia Megert : Bern 1974) 1 fol. With forwords by Klaus Gallwitz and Hilmar Hoffmann; texts by Reiner Bentmann, Susanne Müller-Hanpft, Hannah Weitemeier, and others. Catalogue of the exhibition 'Rational concepts, English Drawings' in Gorinchem and in De Volle Maan, Delft. 'System + Programm', October 2-[? ], 1976. Catalogue to accompany the exhibition at the Librije Hedendaagse Kunst. Dates unknown. Exhibition catalogue focusing on the relation between the city of Antwerp and ZERO, more specific the exhibitions 'Vision in Motion - Motion in Vision' (1959), 'Anti-peinture' (1962) and 'Integrate' (1964). Edition of 1000 copies. Cover includes leaves of Acer campestre and stamp on the back 'all'.